My group aims to understand how aphids and plants interact with each other at the molecular level. More specifically, we try to dissect the molecular basis of plant immunity and susceptibility, and functionally characterize aphid molecules, called effectors, that contribute to aphid virulence. Aphids are phloem-feeding insects that cause feeding damage and transmit economically important plant viruses to many crops worldwide. These insects form close associations with their hosts and use specialized mouthparts (stylets), to probe leaf tissue and feed from the phloem. The stylets follow a mainly extracellular route through the different plant cell layers to reach the phloem, and puncture cells along the pathway. During probing and feeding, saliva is secreted, which is rich in proteins and small molecules. The secreted proteins in saliva are delivered inside plant cells and the extracellular space where they are involved in the manipulation of host cellular processes to benefit the infestation process. We use a combination of large-scale (“omics”) approaches to look at the transcriptional and proteome changes that take place in both plants and aphids during interactions. In addition we are interested in understanding the functions of salivary proteins that function as effectors. More information on our main projects and the tools we use is detailed below. Our work contributes to the development of novel strategies to control infestations by aphids and potentially other pests and pathogens, thereby improving crop yields and food security both in the UK and elsewhere, including in developing countries. Many aphid species are restricted to one or few host plants, while some aphids, many of which are of agricultural importance, can infest a wide range of plant species. An important observation is that aphids spend a considerable time on nonhost species, where they probe the leaf tissue and secrete saliva, but for unknown reasons are unable to ingest phloem sap. These findings suggest that aphids, like plant pathogens, interact with nonhost plants at the molecular level, but potentially are not successful in suppressing plant defenses and/or releasing nutrients. We are interested investigating the molecular changes in both plant and aphids during host and nonhost interactions. We use a range of "omics" approaches to gain insight into both plant and aphid genes and proteins involved in determining host range. 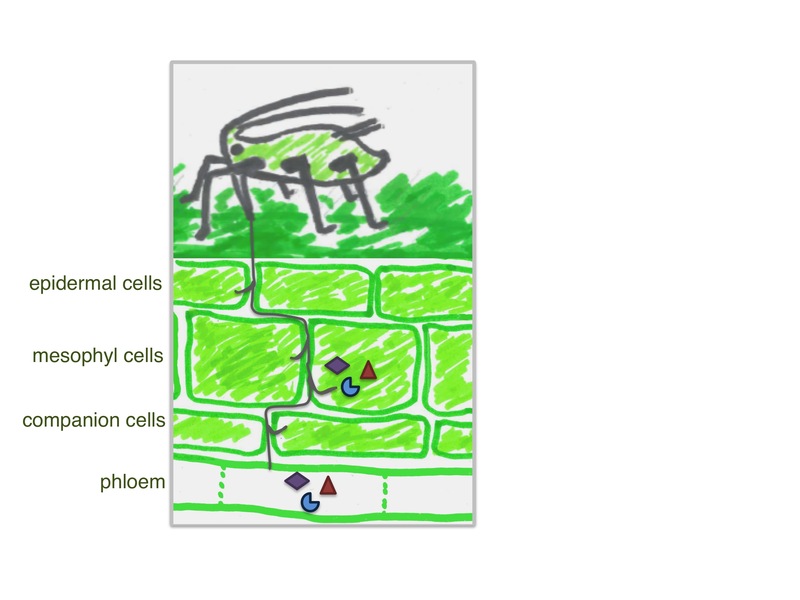 To gain insight into the mode-of-action of aphid effectors we aim to characterize their role in host cell manipulation. We use a combination of approaches including confocal microscopy, yeast-2-hybrid screening, biochemistry approaches, as well as functional assays in different plant species to achieve this aim. Effector localisation work has identified different intracellular localisation into membranes, nuclei and cytoplasm. In addition, we use proteomics and yeast-2-hybrid screens to identify plant targets of candidate effectors and elucidate mechanisms of host cell manipulation. To study effector and host target contribution to virulence we use a combination of in planta overexpression and silencing and aphid performance assays. Our work recently led to the first report of an aphid effector-host protein interaction. We showed that aphid effector Mp1 interacts with a host protein involved in plant cell trafficking. The ability of the effector to interact with this host protein was linked to its virulence activity. Also, aphid infestation leads to degradation of the host protein indicating it is a potentially important virulence target. Figure legend: Aphid mouthparts (or stylets) penetrate the leaf surface and follow a mainly intercellular pathway to reach the phloem. Most cells along this pathway are punctured by the aphid stylets. Saliva is secreted along the intercellular stylet pathway, into the different cell types along the stylet pathway, and into the phloem. This saliva contains proteins that are predicted to function as effectors through interacting with and/or modifying host proteins. These events likely result in suppression of host defenses and a change of host physiology to promote nutrient uptake. Rodriguez, P.A., Stam, R., Warbroek, T., Bos, J.I.B. 2014. Mp10 and Mp42 from the aphid species Myzus persicae trigger plant defenses in Nicotiana benthamiana through different activities. Molecular Plant-Microbe Interactions 27:30-39. Rodriguez, P.A. and Bos, J.I.B. 2013. Towards understanding the role of aphid effectors in plant infestation. Molecular Plant-Microbe Interactions 26:25-30. Hogenhout, S.A., Bos, J.I.B. 2011. Effector proteins that modulate plant–insect interactions. Curr Opin Plant Biol, 14: 422-428. Bos, J.I.B., Prince, D., Pitino, M., Maffei, M.E., Win, J., and Hogenhout, S.A. 2010. A functional genomics approach identifies candidate effectors from the aphid species Myzus persicae (green peach aphid). PloS Genetics 6: e1001216. Bos, J.I.B., Armstrong, M.R., Gilroy, E.M., Boevink, P.C., Hein, I., Taylor, R.M., Zhendong, T., Vetukuri, R.R., Harrower, B., Bryan, G., Whisson, S.C., Sadanandom, A., Kamoun, S., Birch, P.R.J. 2010. Essential Phytophthora infestans effector AVR3a manipulates plant immunity by stabilizing hostU-box protein CMPG1. PNAS, 7:9909-14. Haas B. J., Kamoun S., Zody M.C., Jiang R.H.Y., Handsaker, R. E., Cano L. M., Grabherr M., Kodira C.D., Raffaele S., Torto-Alalibo T., Bozkurt T.O., Ah-Fong A.M.V., Alvarado L., Anderson V.L., Armstrong M.R., Avrova A., Baxter L., Beynon J., Boevink P.C., Bollmann S.Y., Bos J.I.B., et al.,. (2009). Genome sequence and comparative analysis of the Irish potato famine pathogen Phytophthora infestans. Nature. 61:393-398. Bos, J.I.B., Chaparro-Garcia, A,. Quesada-Ocampo, L.M., McSpadden Gardener, B.B., and Kamoun, S. 2009. Distinct Amino Acids of the Phytophthora infestans Effector AVR3a Condition Activation of R3a Hypersensitivity and Suppression of Cell Death. Molecular Plant-Microbe Interactions, 22:269-281. Schornack, S., Huitema, E., Cano, L.M., Bozkurt, T.O., Oliva, R., van Damme, M., Schwizer, S., Raffaele, S., Chaparro-Garcia, A., Farrer, R., Segretin, M.E., Bos, J., Haas, B.J., Zody, M.C., Nusbaum, C., Win, J., Thines, M., and Kamoun S. 2009. Ten things to know about oomycete effectors. Mol Plant Pathol, 10:795-803. Win, J, Morgan, W., Bos, J., Krasileva, K.V., Cano, L.M., Chaparro-Garcia, A., Ammar, R., Staskawicz, B.J., and Kamoun, S. 2007. Adaptive evolution has targeted the C-terminal domain of the RXLR effectors of plant pathogenic oomycetes. Plant Cell, 19:2349-2369. G. Alfano, M.L., Lewis Ivey, C. Cakir, J.IB. Bos, S.A. Miller, L.V. Madden, S. Kamoun, and H.A.J., Hoitink. 2007. Systemic Modulation of Gene Expression in Tomato by Trichoderma hamatum 382. Phytopathology, 97: 429-437. Bos, J.I.B., Kanneganti, T.D., Young, C., Cakir, C., Huitema, E., Win, J., Armstrong, M.R., Birch, P.R., Kamoun, S. 2006. The C-terminal half of Phytophthora infestans RXLR effector AVR3a is sufficient to trigger R3a-mediated hypersensitivity and suppress INF1-induced cell death, Plant J, 48: 165-176. Armstrong, M.R., Whisson, S.C., Pritchard, L., Bos, J.I.B., et al.,. 2005. An ancestral oomycete locus contains late blight avirulence gene Avr3a, encoding a protein that is recognized in the host cytoplasm. PNAS, 102:7766-7771. Liu, Z., Bos, J.I.B., Armstrong, M., Whisson, S.C., da Cunha, L., Torto-Alalibo, T., Win, J., Avrova, A.O., Wright, F., Birch P.R.J., and Kamoun, S. 2004. Patterns of diversifying selection in the phytotoxin-like scr74 gene family of Phytophthora infestans. Mol Biol Evol, 22:659-672. Huitema, E., Bos, J.I.B., Tian, M., Win, J., Waugh, M.E., and Kamoun, S. 2004. Linking sequence to phenotype in Phytophthora-plant interactions. Trends Microbiol, 12:193-200. Bos, J.I.B., Armstrong, M., Whisson, S. C., Torto, T., Ochwo, M., Birch, P. R. J., and Kamoun, S. 2003. Intraspecific comparative genomics to identify avirulence genes from Phytophthora. New Phytologist, 159:63-72. Bos, J.I.B. and Hogenhout, S.A. 2011. Effectors in Plant-Insect Interactions in “Effectors in Plant Microbe Interactions”, John Wiley & Sons. Morgan, W., Bos, J., Bruce, C., Lee, M., Liu, H.-Y., Oh, S.-K., Song, J., Win, J., Young, C., and Kamoun, S. 2008. Structure and function of RXLR effectors of plant pathogenic oomycetes. In "Genomics of Disease", J.P. Gustafson, ed. Springer. Bos, J.I.B., Young, C, Win, J., Armstrong, M.R., Birch, P. R. J., Kamoun, S. 2005. Characterization of AVR3a of Phytophthora infestans, a Member of the RXLR Family of Cytoplasmic Effectors. Biology of Plant Microbe interactions, Volume 5. 576-579.